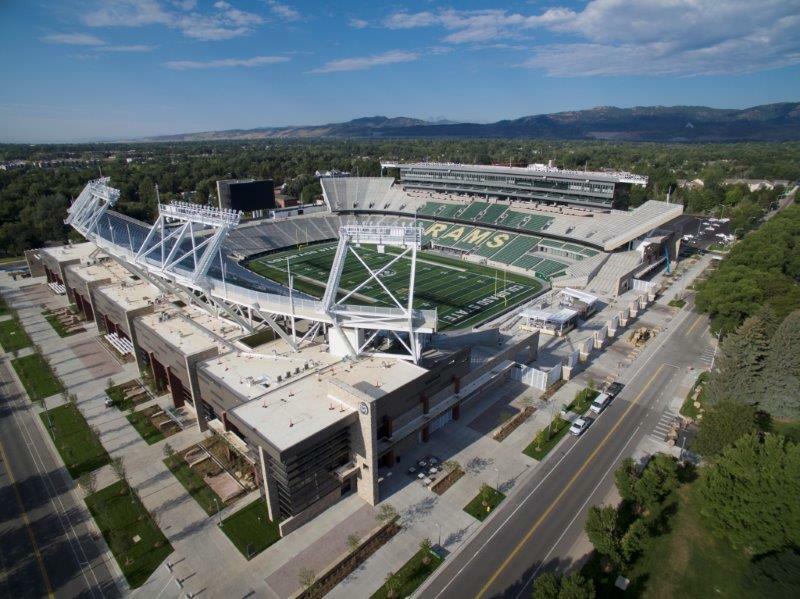 After almost half a century of playing football outside the campus, Colorado State University commissioned a series of studies into a new stadium within the campus. Considered crucial for better atmosphere and a step towards more modern facilities, the 40,000-capacity stadium was approved, with roughly 40,000 m2 earmarked for the project. Designed by Populous, the ground is almost a typical university stadium and yet is also unique in its own way. Field of play is slightly wider than regular and the seating bowl is cut in order to combine the oval of stands with rectangular, almost square, plot occupied by the stadium. The lower tier of stands is U-shaped, with opening towards the north, or towards the university campus. 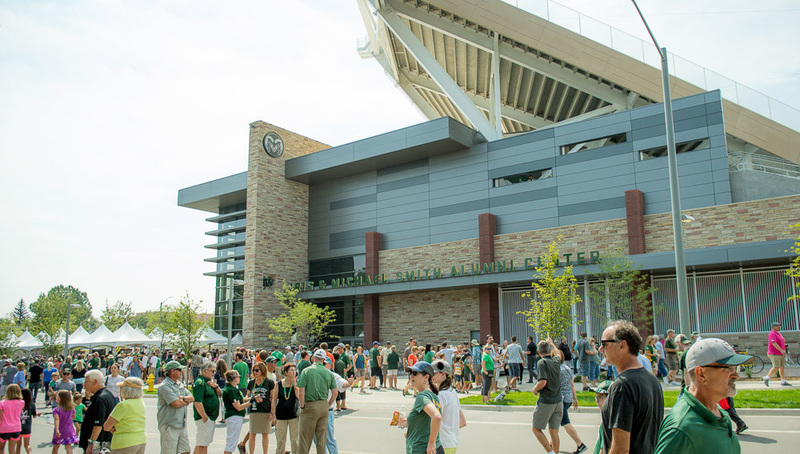 Main gates are located here, creating a connection between the stadium and the rest of CSU facilities. With not terracing in the north, a pub-like area was created for beer enthusiasts watching games. Similar space can be found on field level of the central west stand. Vast and aesthetically dominant upper tiers (peak at 37.5m) were erected only on the west and east, though they're not symmetrical. The south end has a single tier and is topped by a large screen of 395 m2. The screen rests upon a spacious pedestrian concourse (7,244 m2) connecting all stands. Though visially light and open, the stadium also offers quite a lot of closed floor space. We don't only mean the famously huge American football locker rooms and weight rooms (the latter spreads across 845m2! ), but also over 7,400 m2 of academic space for classrooms and counseling, state-of-the-art lockers rooms, offices, and training and sports medicine facilities. The main stand itself has 6 floors overall, including room for 23 private boxes and roughly 1,000 business/VIP guests. Structurally the stadium is as simple as NCAA facilities have got us used to. Roofless and almost bare, the reinforced-concrete and steel mixture is, however, elegantly clad with glass, composites and yellow sandstone, a locally sourced material. 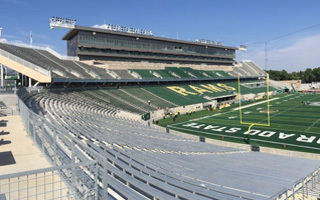 Construction began in 2015, following very fast sale of bonds that secured funding of $220 million, to be repaid from donations and future stadium revenue. With no major issues the project concluded in August of 2017 and was filed for LEED certification.